Rachael Gorchov, Eight Thirty and Eight Forty Five, included in the exhibition Nonspecific Places. How do the social constructions that surround us affect our innate impulse to create, and as viewers, to interpret what is placed before us? Simuvac Projects seeks to address these questions from an original perspective realized amongst the convolutions of our post-post-(post? )modern world. 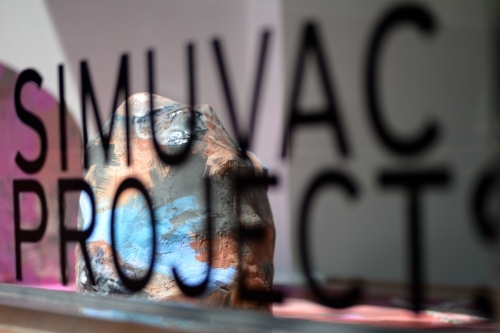 Simuvac Projects is a curatorial initiative that showcases work by emerging and established artists at galleries, pop-ups, and fairs. It began as a gallery in Greenpoint, Brooklyn and shed its permanent space after several well-received exhibitions. Simuvac Projects' exhibitions have been reviewed in The New York Times, The Wall Street Journal, Hyperallergic, and The Brooklyn Rail. Please join our mailing list to stay informed about upcoming projects.